More recent articles have padded the total numbers � in August 2015, Time Magazine estimated 2 million; the same month, Boston Magazine 2.2 million, and so on; however the most recent survey data I have is this 2011 study, which is undoubtedly low. These numbers do not include families who are homeschooling for part of the year (in case of illness or travel), nor does it include the many afterschoolers. Of the children who attend regular bricks and mortar schools (public and private), 64% of them have parents who engage in some form of afterschooling, ranging from simply checking that homework is done to active tutoring. There are a lot of homeschool teachers out there. Reading blogs and forums from homeschooling families back up the trends described by this survey, and in addition, a great many families have decided to homeschool because the local public schools were not meeting the needs of learning disabled, gifted, or twice-exceptional (gifted and learning disabled, often called 2E) children. Even in places with strong public schools, over-worked teachers may not be able to devote enough time to the outliers. Another reason, which surprised me, was many families had withdrawn their children from public schools because there was too much religion embedded in the school's outlook and instruction. In the early days of American homeschooling, a majority were doing so for religious reasons, but today, homeschooling for academic and social reasons is rapidly becoming the norm. Is Homeschooling Right for Your Family? Do you have the time to teach them? The Robinson vision of the parent working at his desk on his own projects while the children study is not the norm. Homeschooling elementary school requires a large investment of time on behalf of the teacher. I often sneak in other projects during school hours, but school goes better when I do not. We seem to get away with our schedule of six months of intensive school, followed by six months of relaxed schooling, where my work demands eat into school time (and the children exploit my lack of focus and study only the things that interest them). In elementary school, my time commitment was four or five hours a day, seven days a week, six months a year. In middle school, Helen and Anna do more schoolwork, but much more of it is independent, so while I need to be at home for five or six hours a day, seven days a week for six months of the year, I have more time to work on other projects at the same time. During my work season, I spend two or three hours a day on school on my infrequent days off. For those of you adding up -- and I only did it for the first time while writing this paragraph -- having school seven days a week for six months is roughly the same as nine months of US public school with weekends and vacations: 180 days. (British state schools have 195 class days a year). Helen and Anna do get a few days off in that time period, of course, but we ignore the calender week. I spent a year without working, and in that time period, we had school "every day" and managed just about 200 full days of school in 365 days. Another option is to find an outside tutor to teach some or all of the schooling. 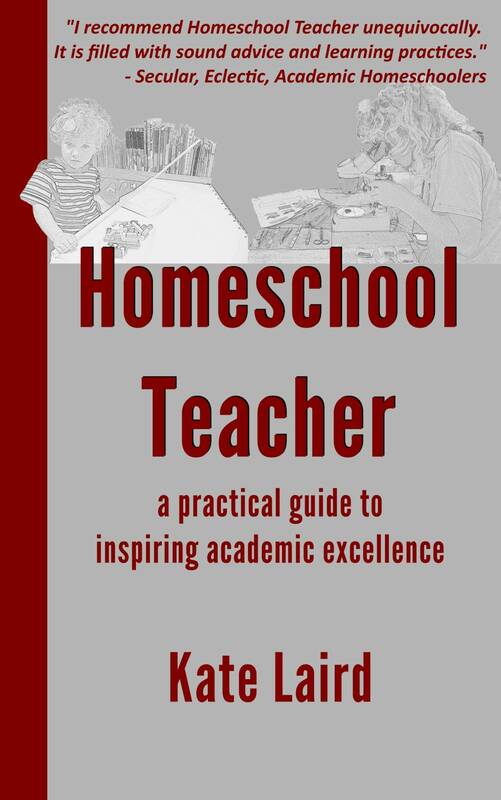 I often use the word "parent" in this book, and I expect most of its readers will be parents teaching their children, but it is equally appropriate for unrelated tutors structuring a homeschool. Recent college graduates often make good tutors, and are sometimes willing to trade their teaching for an adventure -- I certainly was very happy to work for room and board and a sailing voyage across the Pacific when I was twenty-two. Homeschooling for a year or two for extraordinary circumstances means you can be more minimalistic in your schooling -- if the trip / job / sabbatical will take you into another culture for a relatively short period of time, your children will probably get as much out of the new environment as they would out of an extra couple of hours of schooling every day. If you are homeschooling in order to give your children a break from school, but plan to put them back in with their peers at the end of a year, however, you may feel far more pressure than the long-term homeschoolers, because you need to keep up. Laurie Brodie, writing in Brain, Child magazine, describes this as the most difficult type of homeschooling, because there is little support in either homeschooling groups or books. For these short-term homeschoolers, beginning with more structure can help -- it is easy to relax rules as the year progresses but much harder to transition to a stricter regime. However, whether on the road, around the kitchen table, or in a hospital room, the short-term homeschoolers can take comfort in the idea that they don't need to do it all, and as long as they match the local school's goals for math, the children will probably re-integrate well. With only a few students, you will likely be able to do a better job than local schools on instilling reading and writing stamina, and you can then pick and choose between other subjects based on either student-led interests or parent-led focus on weaker areas. What are your goals for your children's educations? It can be helpful to think explicitly about your goals for homeschooling, especially if you are considering teaching your children at home for many years, or conversely, if you are afterschooling, because you will be adding on hours to an already packed day. Short-term homeschoolers can afford to be more relaxed in their overall goals, although they may have immediate goals defined for them by local school authorities. Your list may not look exactly the same. I used to have "knowing how to learn" on the list and changed it to "knowing how to research." Research is something I do every day; the learning is unconscious. You may have more goals than I do, you may have fewer. I do think that it is important for children to be doing college preparatory work regardless of their (and your) aspirations. I know many people who decided not to go to college, and then went in their late twenties or later, and it was enormously valuable for them -- maybe even more so than for all those who started at eighteen. A well-educated person can express him or herself in writing, clearly, concisely, and is able to do so whether writing many-times revised material, or dashing off an email. Grammar, spelling, and punctuation have to be standard. A well-educated person can do algebra, and uses it in day-to-day life. The best way to become good at algebra is to keep taking math for as many years as possible after algebra. An experiment tested people fifty years after their last algebra exam, and the most important factor in their retention of math was how many years of math they'd done after algebra. It was better to get a C in algebra and keep studying math for four years than to get an A in algebra and stop there. A well-educated person can speak a second language. That's it: reading, writing, arithmetic, and language. For me, those are the important things, in order. Your list might shuffle things around, and of course there's art, music (which may really make you smarter), public speaking, health, sports, and so on. But the heart of an education is found in these four things. But how do you get there? How do you take the child who is sitting on the floor trying to eat a Cheerio through his nose and turn him into this mythical well-educated person? 1. A. Noel, P. Stark, and J. Redford, J. Parent and Family Involvement in Education, From the National Household Education Surveys Program of 2012 (NCES 2013-028), National Center for Education Statistics, Institute of Education Sciences, U.S. Department of Education. Washington, DC. 2013. Retrieved [2 March 2015] from http://nces.ed.gov/pubsearch. US population statistics taken from http://quickfacts.census.gov/qfd/states/00000.html Retrieved [2 March 2015]. 4. E. D. Hirsch Jr. Cultural Literacy: What Every American Needs to Know. Boston: Houghton Mifflin, 1987. 5. Daniel T. Willingham. Why Don't Students Like School? A Cognitive Scientist Answers Questions About How the Mind Works and What it Means for the Classroom. San Francisco: Jossey-Bass/John Wiley & Sons, 2009, 89.